A nurse is rising to the challenge of her life by swapping the hospital ward for the boxing ring. Ward manager Claire Smith, who works at the planned intervention unit at Leighton Hospital in Cheshire, is competing in a charity boxing match in support of two hospital trusts. She is raising funds for her own Mid Cheshire Hospitals NHS Foundation Trust and the Cheshire and Wirral Partnership NHS Foundation Trust, who supported her son with managing autism. 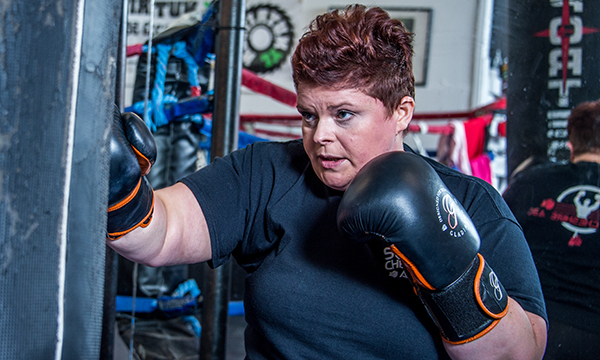 Ms Smith has undergone intense training, sparring four times a week with volunteers at a local boxing club in the lead up to the Pink Collar Boxing event later this month. She has also steered clear of alcohol since November. ‘I’m nervous, but I know I’m fighting for two very worthy causes,’ said Ms Smith. ‘It’s been hard. But every day is hard for Matthew because of his autism. Ms Smith’s bout will take place at the Royal Park Hotel in Warrington, Cheshire, on 26 February at 3pm. For more information, or to make a donation, contact: claire.dave96@gmail.com.